The Moedim are set forth in Leviticus as G-d's appointed “holy convocations” or “assemblies”. How does modern Jewish practice reflect G-d's exacting requirements? Is there a deeper interconnected theme running between and within G-d's Moedim? Is Passover one unified encounter or should it be reflected precisely as Leviticus instructs? Does Atonement as practiced today obscure G-d's deeper plan? How is it possible to reconcile modern practice with the demands of the Tenach? How do the key covenants expressed in Genesis, Exodus, 2 Samuel and Jeremiah relate to each other? Is there a unifying theme? This book explores fundamental questions that require a considered answer. Recommended for all who seriously want to understand the demands of Leviticus as they impact us today. 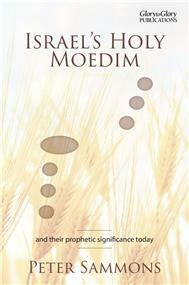 “Israel's Holy Moedim” makes considerable use of simple diagrams to develop its themes. Peter Sammons - a UK based author and publisher, whose books include “The Prince of Peace” and “The Empty Promise of Godism”. He has a reputation reducing sometimes complicated theological themes to concepts that we can all relate to. General readers. Jewish readers interested in the instructions of Leviticus and Genesis. Useful for both personal and group study. This book is substantially the same as “The Messiah Pattern”. It is aimed at a Jewish readership and is published by Glory to Glory Publications. It is also available via "createspace" which provides the optimum buying mechanism for single copies for APAC / Australasia / Americas customers. Please follow the relevant link. CUSTOMER AWARENESS: Some of our books are available through Amazon. When buying through Amazon, note that various services are periodically offered on a subscription basis in addition to the purchase actually being made. Sometimes Amazon expect customers to “un-check” a check box so as to opt-out (rather than opt-in) to the purchase. Our advice is to be alertfor opt-outs, which may not be prominently displayed. And of course if you are required to “un-check” a box, then DO un-check it!